During the past year, we began the process required to offer a specialty car tag made to support our Ronald McDonald House. This program raises hundreds of thousands of dollars for other organizations each year. 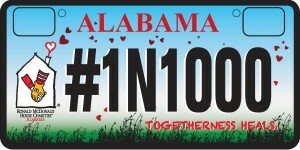 In Alabama, in order to get a new license plate design into production, you must first have 1,000 individual cars committed to driving around with the tag. For us, this means we need 1,000 pre-commitments before we can receive any money from our efforts. We are SO close to reaching that goal of 1,000. That is our final destination. And the first 1,000 get an extra bonus – the tag is FREE for the first year with no further commitment to continue! Now, in March, we have the final destination in sight. That being said, we must reach it by May 2016 in order for the tag to become a reality. Not only can this be a HUGE fundraiser for the House, but it can help spread awareness of our mission throughout the state. The only way we can do this is with YOUR help. It is very simple to sign up. You will need basic information about your car including the VIN number and basic personal information. It is also FREE if you sign up as one of the first 1,000. That’s right, RMHCA is paying for the first 1,000. We need these pre-commitments so we are investing in ourselves. We are paying the $50 specialty car tag fee for the first year for each of the first 1,000 who sign up. If you do not want the tag after that first year, you do not have to renew it and you will not be charged the specialty rate. Of each $50 specialty car tag, RMHCA will get $41.25 back — that amount will add up quickly once the car tag is in production and available to anyone renewing their tag. I currently have a handicap tag, can I keep the handicap tag with the RMHCA specialty tag? Sadly, no, but you can get a handicap hang tag for the front window and have the RMHCA specialty tag. Can I get a RMHCA tag for my motorcycle? No, not at this time — but wow! How cool would that be? We can hope for this in the future! Can I specialize the text on the tag? Yes, as long as it is within the number of characters allowed and follows the DMV’s guidelines. Note: Additional fees will be collected by the DMV. My tag renews (enter a month/year), will you have 1,000 pre-commits by then? We need YOU to sign up now regardless of when your tag renews. You will receive a certificate when all pre-commitments have been received that can be used at any time, no matter when you renew your tag. What can my $41.25 do for the House anyway? It costs RMHCA $95/night to House ONE family. 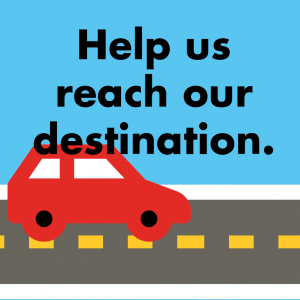 You can help us offset that cost to provide the services needed. What will the tag look like? You can see a sample of the tag to the right. 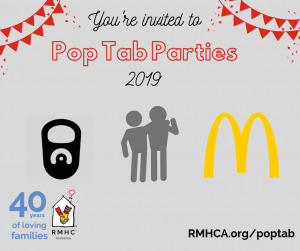 This is a slogan/hashtag RMHCA came up with to help promote the tag. As one of the first 1,000 who pre-commit, you could be ONE of them supporting the mission of the House. I’ve already signed up, how can I help? Tell your friends — share it on social media, talk about it at work, share with your church, email your friends the link! I have multiple cars, can I sign up more than once? YES! Please do — this is per VIN number so you can get multiple FREE tags if you sign up each car within the first 1,000. What happens when the destination is reached? The tag will go into production with the state — and will start being an option at the DMV. We will no longer be covering the $50 fee. Anyone who has pre-committed will get a voucher to redeem when their tag comes up for renewal. This voucher will allow them to get the RMHCA tag at no cost to them (other than regular motor vehicle fees). Your VIN number is on your car registration and insurance card. it is also typically on the inside of your car door or at the bottom of your windshield on the driver’s side. *If your question was not answered, please contact Laurie Smith at laurie.smith@rmhca.org or (205) 638-7269.